Sena is from Cape Coast, Ghana, West Africa and has been dancing since she was 7 years old. As a young girl growing up she always knew what she wanted to do. Growing up in her mother’s local drumming and dance group she was able to pursue her passion for dancing. She is also a very great drummer as dancing requires one to be able to hear and have a conversation with the drummer. She also teaches drumming. Sena has also travelled with her mother Adwoa Kudoto, the award winning only female master drummer in Ghana, throughout the US teaching and performing in Washington, New York, Michigan, Atlanta and California. 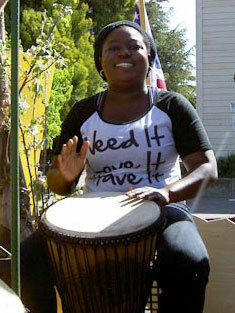 Sena was always willing to learn, learning how to have fun drumming and dancing. Dancing has always been part of her life and she does it with enthusiasm and joy!